The final day of the ITF Grade 1 International Hard Court Championships got off to a subdued start, with Miomir Kecmanovic of Serbia and Oliver Crawford coming to the Junior Tennis Champions Center for photos and paperwork, but no match, with Crawford unable to play the final due to an ankle sprain suffered in his doubles semifinal on Friday. So the girls final, usually played at the same time as the boys final, had the spectators' undivided attention, with No. 2 seed Claire Liu and No. 7 seed Xiyu Wang of China battling for nearly three hours before Liu emerged with a 6-3, 4-6, 6-3 victory. Liu took an early 3-1 lead in the first set and closed out the set in just under an hour with her second break of Wang's serve. Although Liu went up 3-1 in the second set, Wang steadied herself, immediately broke back and then earned a chance to serve out the set with a second break of serve at 4-4. Although, as in most of the games, nothing came easy, Wang did close out the set on her third set point, and both girls headed for the air conditioning of the clubhouse for the 10-minute heat rule break. Although both Liu and Wang possess fine serves, the third set started out with six consecutive breaks, and rarely did either player have a game point on her own serve. Wang was winning most of the longer points with her powerful left-handed strokes keeping Liu defending and unable to use her ability to close at the net. Down a break at 1-0, 2-1 and 3-2, the outlook for a Liu victory was not good, but each time she broke back, using her backhand to take control early in the rallies. "I didn't want to lose," said Liu. "I competed well and that's what helped me get back the breaks and eventually hold. I was always being aware of my opponent and what was working and what wasn't, so when it came down to it, that really helped." Liu finally held with a good first serve to go up 4-3, and Wang, looking a bit tired, started to lose control of her forehand, and again was broken, giving Liu a chance to serve for the match. Even though she had been unable to hold her serve the first three times, Liu had confidence in that shot. "The whole match I was trying to serve well, because I didn't serve well yesterday," Liu said of her three-set semifinal win over Hailey Baptiste. "I knew, against her, I needed to serve well or else she would be aggressive from the very beginning. So doing that really helped me stay in the match." Even though Liu made four of five first serves in her attempt to close out the match, she had to save a break point at 30-40 in that final game, which she did with another good first serve. In the next point, Liu came up with a big forehand to force an error and get to match point, which she converted with a backhand winner. Liu, although just 16, said the extra year of experience she has over the 15-year-old may have given her the edge. "I think mainly in the beginning and then in the third, the experience thing helped," said the Californian. "Starting off strong, even if you're not playing well, having a good attitude and good posture really helps. And when it gets tight having all those matches, yeah, that can definitely play into it." Wang was not happy with her performance at the beginning of the match. "First set was so-so," said Wang, who is not comfortable communicating in English. "But in the second set and final set, I played better. I played well. She played well." Wang is heading to Canada for the Grade 1 there next week, then on to the US Open Junior Championships, where she is in the qualifying draw. 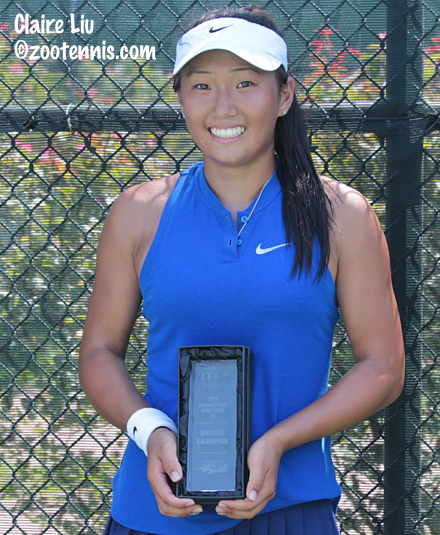 After her stellar play this week, including Friday's semifinal win over ITF No. 1 and Wimbledon champion Anastasia Potapova of Russia, Wang is ready for the big stage. "I am now more confident," Wang said. Liu is not playing in Canada, but instead is staying in Maryland to train for the US Open Junior Championships with a group of other US girls. Thirty minutes after the completion of her singles match, Liu was back on the court for the doubles final, and the Wimbledon girls doubles champion earned that title too, partnering Sofia Sewing to a 6-3, 6-2 win over No. 8 seeds Morgan Coppoc and Victoria Emma. 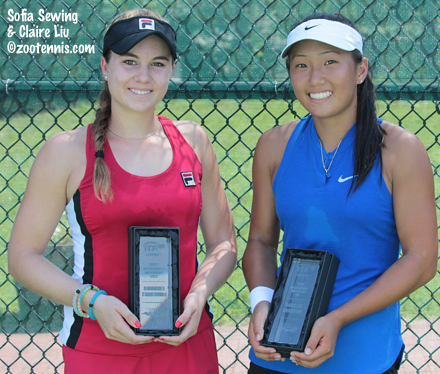 Sewing and Liu, who were unseeded, had never played together before this week, but when Sewing's partner Ellie Douglas withdrew due to injury and Liu's partner Usue Arconada received a US Open qualifying wild card, they decided to team up at the last minute. "We've played some good matches this week, but this is probably the most consistent one," Liu said. "Before we would lose the first set or something, but we played well the whole time." "We have good chemistry," said Sewing, a 17-year-old from Florida. "We let each other play aggressively, so that was good." The boys doubles champions were also an unseeded pair playing together for the first time. 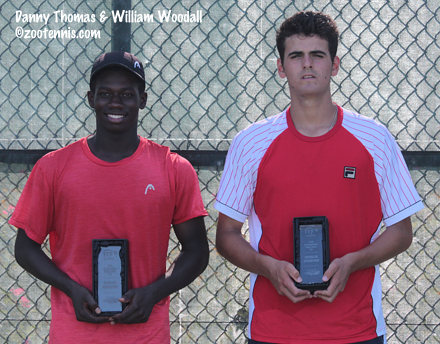 Danny Thomas and William Woodall won their first Grade 1 titles by defeating unseeded Nicolas Mejia of Colombia and Sebastian Korda 6-3, 3-6, 10-6. Thomas and Woodall took out top seeds Kecmanovic and Youssef Hossam of Egypt 6-1, 6-3 in the quarterfinals, a win that convinced them they could claim the title. "Taking out the first seeds was pretty big for us," said Thomas, a 16-year-old left-hander from Ohio. 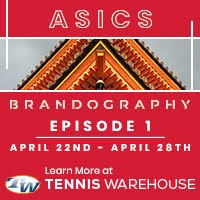 But they had to overcome two match points in their 6-7(4), 6-3, 14-12 victory over Crawford and Patrick Kypson on Friday, the match that saw Crawford sustain his ankle injury. "Oliver and Patrick are a really good team, have played together for a while and I felt today would be a little easier than yesterday," said Woodall, a 16-year-old who trains at the Junior Tennis Champions Center. "I thought if we came out with really good intensity in the tiebreaker we could win, and that's what we did." Woodall and Thomas got a mini-break for a 2-1 lead and that was all they needed, as neither lost his serve, with Woodall blasting a big service winner to close out the title. With so much success in their first tournament together, Thomas and Woodall are hoping to team up again. "Hopefully in the future we'll play the same tournament and we'll definitely play together," Thomas said. 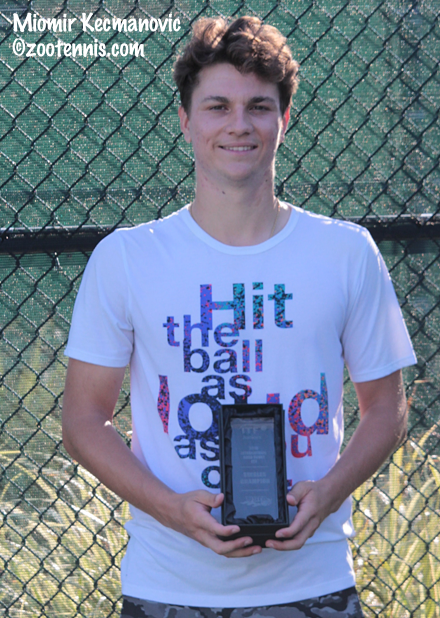 Kecmanovic and Crawford are both returning home before the US Open Junior Championships. Crawford had planned to play in Canada, but his injury has made recovery in time for the US Open the top priority. "We haven't done any x-rays or anything, but I couldn't put much pressure on it today, said Crawford, a 17-year-old from South Carolina. "There was no chance I was going to have any chance of winning, so there was no point in getting it worse. Hopefully I can get back and be ready for the Open. I'm going to fly home today, I have a trainer I work with back home, get an x-ray and take some rest, do all the recovery stuff I can do." "It's very disappointing," Crawford said. "It's my first Grade 1 final. This is one of the best weeks of tennis I've ever had, playing my best tennis right now and it's a shame that I couldn't play. I'm not saying I would beat Mischa, he's a very good player and I would have had to play very, very well to beat him. But he's had a great tournament and congrats to him." Kecmanovic said he had only gotten a walkover in a final once before, in doubles, in the 14s. "It's not really how I thought it was going to happen," Kecmanovic, who turns 17 next week. "I hope he gets better fast and he can play at the Open." Kecmanovic, who will return to the IMG Academy in Bradenton before heading to New York for the Open, is happy with his play this week. "I've been playing pretty good this week," Kecmanovic said. "I haven't lost a set, had only one tough set and it was against some pretty good guys, some top guys and I'm happy to play that way. It's a good warmup to the US Open." The Orange Bowl champion has yet to reach the quarterfinals of a slam, but his current level has him expressing optimism about his prospects for the last slam of the year, on a surface that suits him. "If I play like I played this week, I think I can go deep this time," Kecmanovic said. 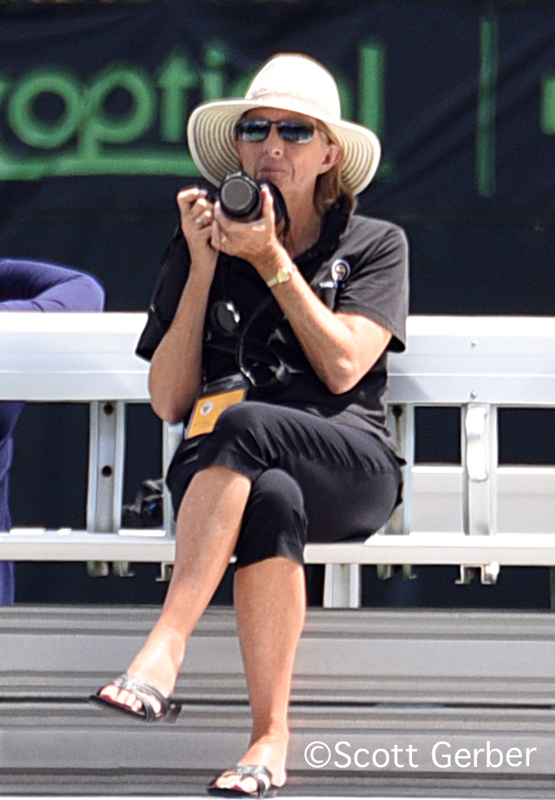 Complete draws and a photo gallery can be found at the tournament web page.